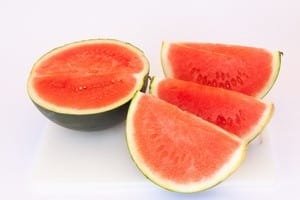 Watermelons originally come from Africa and are actually a special kind of berry called pepo. They are known for their smooth rind, which is the tough outer skin, usually green with dark green stripes. A watermelon is more than 91 percent water. In addition, it also contains a fair amount of sugar. Because of this, watermelon should be seen as a treat for your long-eared friend. Limit portions to about one inch (= 2.5cm) cubes per rabbit per day. As watermelon juice is quite sticky, offer pieces they can easily eat in order to avoid their fur getting dirty. When offering for the first time be sure to start with a small amount to see your bunny’s reaction. Aside from the interior flesh, the watermelon rind is also safe for bunnies to eat. When it comes to the watermelon seeds, we haven’t come across any reference saying that they are poisonous to rabbits. Just to be on the safe side we advise that you remove the seeds before feeding. Conclusion: rabbits can have watermelon but don’t let them have too much. Have you ever given watermelon to your rabbit? We’re curious to find out.